"Whether it's a Sikh man on a Greyhound bus, or an Arabic speaker on a Southwest airplane, the xenophobic fear and bigotry in our country is out of control," Gurjot Kaur, senior staff attorney at The Sikh Coalition, told NBC News. "By filing this complaint, we hope to bring attention to the crisis facing minority communities today. The list of things brown people can't do on public transportation is growing — we can't get a can of Diet Coke, we can't switch seats on a bus or a plane, we can't speak in a language other than English, really we can't be human beings." Article was at the top of Reddit for a day, with over 5833 shares and 2463 comments. Wow. "This is the fifth anniversary of the death of my nephew, and justice certainly wasn't served," Chu said. "Of the three that were involved, two were let go without any punishment, and one was put into one month confinement. So it is time for the military to treat hazing seriously. Our men and women in uniform protect us and we must do what we can to protect them." Spam musubi, Spam loco moco, Spam adobo, Spam fried rice, and budae jjigae or "army stew." According to Hormel Foods, Hawaii consumes more Spam than any other state, estimated at seven million cans per year....Spam also inspired the Hawaiian-language "The Spam Song," composed by Amy Ku'uleialoha Stillman and Daniel Ho, and recorded by Tia Carrere and Ho; and the annual Waikiki SPAM Jam, touted as the largest festival in Hawaii and scheduled for this coming weekend. "From the beginning, the community was not interested in punishing Mr. Durazo," Kaur said. "Instead, we were deeply invested in educating him and the surrounding community. This, we firmly believe, is the key to combating hate in America." "But if we believe in racial justice, we cannot excuse an officer for killing an innocent, unarmed Black man and failing to provide medical help—just because he is Chinese like us. Instead, we should unite our community to fight for the indictment of white officers, or those of any race, and stand in solidarity with other communities of color who demand justice for all victims,"
Co-Sponsored By The Ann Arbor District Library; the Michigan Taiwanese American Organization; The University of Michigan Lieberthal-Rogel Center for Chinese Studies and the Stearns Collection of Musical Instruments. Founded by Tien-Lu Li in 1931, I Wan Jan is one of the finest hand puppet troupes in Taiwan and around the world. The name I Wan Jan describes the vivid, life-like hand puppet movements when controlled by their skillful masters. I Wan Jan has performed on an invitation-basis around the globe since 1971, most recently in11 Mexico cities in 2015. Their performances are often seen at international puppet festivals. In 2016, I Wan Jan will visit New York, Houston, and Ann Arbor for this special performance for the public at the Ann Arbor District Library. The troupe will perform the acclaimed “A Chance Encounter Leads to Marriage.” This event is cosponsored by the Ann Arbor District Library; the Michigan Taiwanese American Organization; The University of Michigan Lieberthal-Rogel Center for Chinese Studies and the Stearns Collection of Musical Instruments. Live music is an integral part to an authentic, traditional hand puppet performance. Besides two puppeteers, the visiting troupe consists of eight musicians performing drums (single skin drum, flat drum), gong, cymbals, erhu, Chinese flute, dulcimer, and suona (Chinese double­reeded horn). A Q & A with the audience will follow. This classic performance will showcase the puppets’ fine movements, such as the young male character folding a fan, the female character holding an umbrella, older male smoking, the clown decking chair, and street entertainers’ bustling martial arts and acrobatic acts. The story begins with the play boy, DU-Xing, and his servants going into the market to watch street entertainment. PAN-Rong also arrives at the market with his daughter, PAN Yu-Zhi, to watch the show. DU Xing falls head-over-heels at PAN Yu-Zhi’s beauty and decides to kidnap her for himself. PAN-Rong’s cries for help attract XIAO Jin-Jun, a scholar well-versed in martial arts who comes flying to the rescue. Although he was fluent in both southern and northern styles of folk drama music, Master Li was also credited for creating a new style of music called Wai Jiang School by blending rich Beijing Opera elements with the traditional Northern Style of folk drama music. After his passing in 1998, many of Master Li’s works have been digitized for future generations to enjoy (http://ltl.gac.ntnu.edu.tw/). His vision, persistence, and efforts in the authentic, traditional puppetry have kept this art form alive today. For more information about this event, call the Library at 327-4555 or visit our website at aadl.org. This presentation will explore the history, styles, and main themes of glove puppet theatre in Taiwan as well as its relationship to other Chinese theatrical and artistic forms. This event is in coordination with the glove puppet theatre performance by the I Wan Jan Puppet Theater on Tuesday, May 24 at 7pm at the Downtown Library. Glove puppet (also called hand puppet) theatre is a traditional theatrical art form that combines aspects of folk arts such as woodcarving and embroidery with traditional music and Chinese dramatic forms based on famous historical novels. This form of puppet theatre has been practiced in Taiwan since it was introduced by immigrants from the southeastern coastal provinces of Fujian and Guangzhou in about the 18th century. Overtime in Taiwan, it developed some distinctive Taiwanese characteristics with the use of the local dialects and artistic styles, as well as theatrical and technical innovations to engage an ever-changing audience. Ann Arbor residents and Eastern Michigan University Professors, Guey-Meei Yang and Tom Suchan, will lead this presentation. 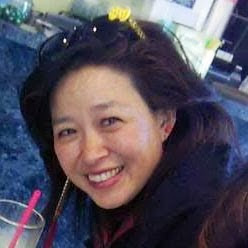 Guey-Meei Yang is a Professor of Visual Art Education with a specialization in multicultural art education and technology integration. Tom Suchan researches medieval Chinese religious art. In addition to their individual fields they have collaborated on a number of joint publications and research projects. For more information about this event, call the Library at 327-4555 or visit our website at aadl.org. The Downtown Library is located at 343 South Fifth Avenue in Ann Arbor. "Our communities have been systemically neglected by lumping us all under the 'Asian' umbrella," said Dinh. "This bill recognizes that beyond each race and ethnicity box is our community's fight for self-determination — for our community's needs and unique strengths to be revealed, not concealed, by transparent data systems." I've been invited to speak at the University of Michigan Law School this Friday, April 15, 12:00-1:00 pm, Hutchins Hall 220, on a panel with Peter Liang's defense attorneys. 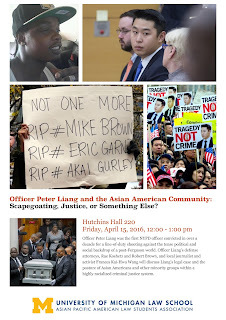 Officer Peter Liang and the Asian-American Community: Scapegoating, Justice, or Something Else? Officer Peter Liang was the first NYPD officer convicted in over a decade for a line-of-duty shooting against the tense political and social backdrop of a post-Ferguson world. 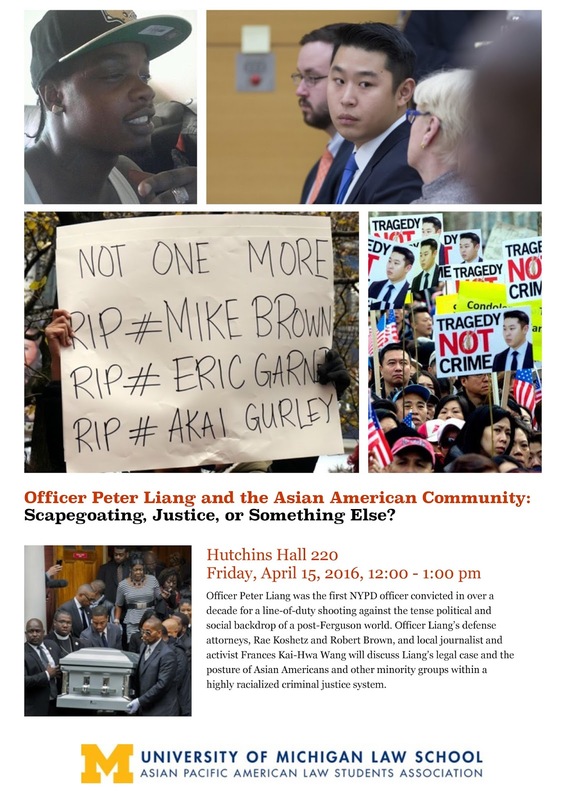 Officer Liang’s defense attorneys, Rae Koshetz and Robert Brown, and local journalist and activist Frances Kai-Hwa Wang will discuss Liang’s legal case and the posture of Asian-Americans and other minority groups within a highly racialized criminal justice system. "In the past two weeks, we just witnessed the military double the number of accommodations that have been granted to Sikh soldiers in over 30 years," Amandeep Sidhu, partner at McDermott Will & Emery, told NBC News. "These recent religious accommodations represent significant progress for our clients, but still contain troubling restrictions that allow the Army the option to revoke the basic freedom of practicing their faith while serving our country. The Army is making progress, but these recent accommodations alone do not absolve the [Department of Defense] from ending the broader ban that prohibits Sikhs from serving like every other American." "I have loved her work for years, and I dare say Whitman would love her work: brave, visionary, and true," Fresno poet laureate Lee Herrick told NBC News. "Her voice is simultaneously American, Asian American, and Hmong American in its singular beauty and originality. It is a groundbreaking book from an important new voice. Great poetry should widen our notion of the human condition, and Vang's poems do that and much more." "I left Bangladesh and traveled across a dozen countries to escape political repression and save my life," Jahed Ahmed, an asylum seeker and DRUM member, said in a statement. "Instead, I ended up rotting away in detention for over 10 months. The U.S. government gave the names of many of the detainees to the Bangladeshi government, and they then leaked them to the media. Our asylum cases and hunger strikes have become a political issue for the Bangladeshi government, and now the Obama Administration wants to deport me back to where I will be disappeared, tortured or killed." "My military service continues to fulfill a lifelong dream," Singh said in a statement. "My faith, like many of the soldiers I work with, is an integral part of who I am. I am thankful that I no longer have to make the choice between faith and service to our nation."